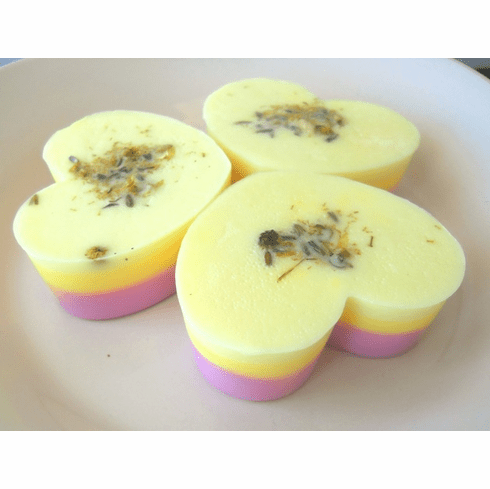 This beautiful, heart-shaped glycerin soap is infused with real chamomile tea! Lather yourself with the intoxicating fragrance of lavender and honey chamomile. Plus, this bar is nutrient-rich because it is made with pure honey, chamomile tea, and olive oil. It is sprinkled with lavender buds and dried chamomile flowers for aesthetics. Weighs approximately 3 oz and comes beautifully packaged inside a printed cellophane bag, a bow, and a scalloped tag. Makes a wonderful small gift! Ingredients: 100% vegetable glycerin soap (coconut and palm oil-based), chamomile tea infusion, raw honey, olive oil.